Students will be able to count coins and write the total value using the cents sign. Explain to students that this means, “Happy New Year, Give me my red envelope!” in Mandarin. Tell students that Chinese celebrate their New Year on the new moon between January 21 and February 20. Explain to students that one of the many traditions of the Chinese New Year is for adults to give children hong bao, which translates to “red envelopes" that have money in them. Teach students that in the Chinese culture these red envelopes grant good luck and happiness. Tell students that during our math lesson today we will be creating our very own hong bao filled with pretend money. Tell students that you will be reviewing the values of different coins before they begin counting the money in their hong bao. Post a piece of chart paper on the board and write the heading “Coin Values." Remind students that the value of a coin is what it is worth. Draw a large penny on the chart paper, and call on a volunteer to name this coin and assign it a value. Write 1￠ next to it. Draw a large nickel on the chart paper, and call on a volunteer to name this coin and assign it a value. Write 5￠ next to it. Draw a large dime on the chart paper, and call on a volunteer to name this coin and assign it a value. Write 10￠ next to it. Draw a large quarter on the chart paper, and call on a volunteer to name this coin and assign it a value. Write 25￠ next to it. Tell students that now that we have reviewed the value of the coins, we are ready to begin counting the coins and adding the value in the hong bao. 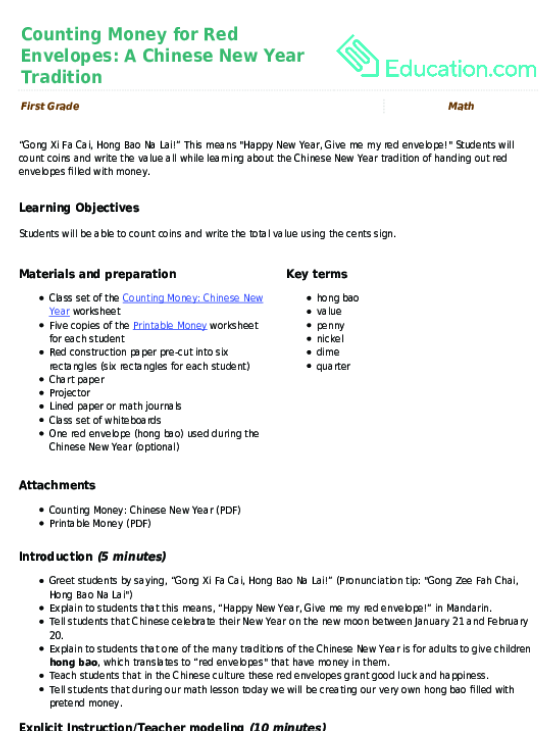 Project the Counting Money: Chinese New Year worksheet onto the board and distribute a copy to each student. Tell students that together we will be counting the coins in each of these hong bao using our Coin Value poster as a resource. First, identify each of the coins in the hong bao. Second, write the value of each coin on a piece of paper (lined paper or math journals). Third, model for students how to add the total value of all of the coins and write this amount using the cent symbol under the hong bao. Ask students to work on the three remaining hong bao on their worksheet independently or with the person sitting next to them. Come together as a class to review students' answers and discuss strategies for counting and adding coins. Explain to students that they are now ready to create their own hong bao. Distribute six red rectangles to each student, and explain that these will be their hong bao. 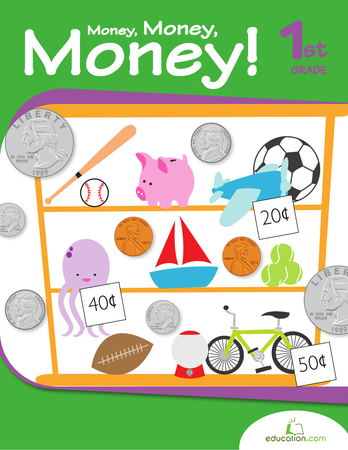 Distribute five copies of the Printable Money worksheet to each student, and ask students to cut out the coins. Ask students to create six hong bao with as much money in each envelope as they want. Instruct students to glue their coins on one side of the envelope and to write the total value (using the cents symbol) on the other side of the envelope. Tell students to use their lined paper (or math journals) to show their work. Remind students to use the Coin Value poster as a resource. During Guided Practice/Modeling, instead of asking students to independently complete the three remaining hong bao, ask students to identify each coin and write the value for each coin. Then, the teacher will model how to add the value of all of the coins so that students will be exposed to more addition modeling before Independent Work Time. 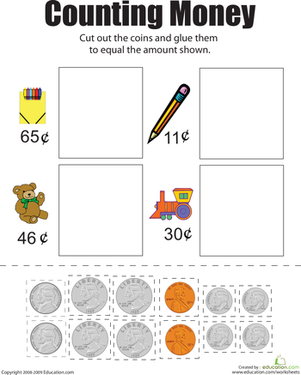 During Independent Work Time, give students more pennies and nickels for their hong bao so that they can work with adding coins with smaller values. During Independent Work Time, students can create 2-3 hong bao as opposed to 6. During Independent Work Time, students can write the quantities and values of each coin they included in their hong bao as opposed to adding the value. 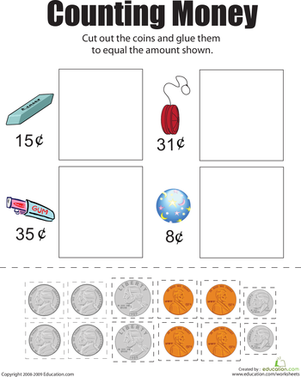 To enhance difficulty, increase the value in each red envelope by adding more coins and/or dollars using the Printable Money worksheet, and teach students how to add and write values over 99 cents. Draw a combination of coins on the board. Ask students to add the total value of all of the coins and write their answer using the cents symbol. Instruct students to hold up their whiteboards so you can check their work. Continue with at least five more coin combinations. Explain to students that we learned about one of the traditional gifts that is given to children during the Chinese New Year celebrations: the hong bao (red envelopes). Teach students that the color red is considered very lucky, and the hong bao symbolize good wishes and good luck for the new year ahead. Tell students to select one of the six hong bao they just created to take home and give to someone in their family. Encourage students to say, "Gong Xi Fa Cai," which means "Happy New Year," when they give the hong bao to a family member, and share what they have learned about the tradition of hong bao in the Chinese culture. Students will count coins and write the value all while learning about the Chinese New Year tradition of handing out red envelopes filled with money.